I returned home from vacation with a horrendous head cold that went into my chest. What do you do when you are on the couch, sneezing, coughing *, wheezing, and running a fever? Plain old stockinette stitch in the round because that is all you are capable of doing. However, the provisional cast on and counting the stitches took way more brain cells than I had available after all the cold medicine! 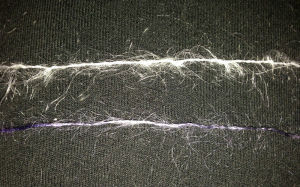 How do the Kasuri and Kidsilk Haze (KSH) compare? While they are both mohair/silk blend yarns, KSH states it is a “Super Kid Mohair” and Kasuri just states “Mohair.” Kid mohair just means the first clipping of an angora goat. “Super Fine” and “Fine” are classifications of kid mohair, based on micron count. I don’t know if “Super Kid” is the same as “Super Fine” or not; however, based on my hands and eyes, KSH and Kasuri appear to of the same quality of kid mohair. KSH put up is 25 g / 210 m. Kasuri is 14 g / 166 m. KSH costs less, even before you factor in the differences in put up. Other differences? KSH is 70/30 mohair/silk whereas Kasuri is 60/40. The Kasuri is a slightly finer yarn than KSH. KSH is a bouclé; Kasuri is not. For all the differences listed in the last paragraph, KSH has a more pronounced halo than Kasuri. Which do I prefer? This is a hard call. While I love all the individual colors in the Kasuri, I’m not thrilled with the way it puddles up. It looks like purple camo. But the hand…I like the hand of Kasuri much more than KSH. 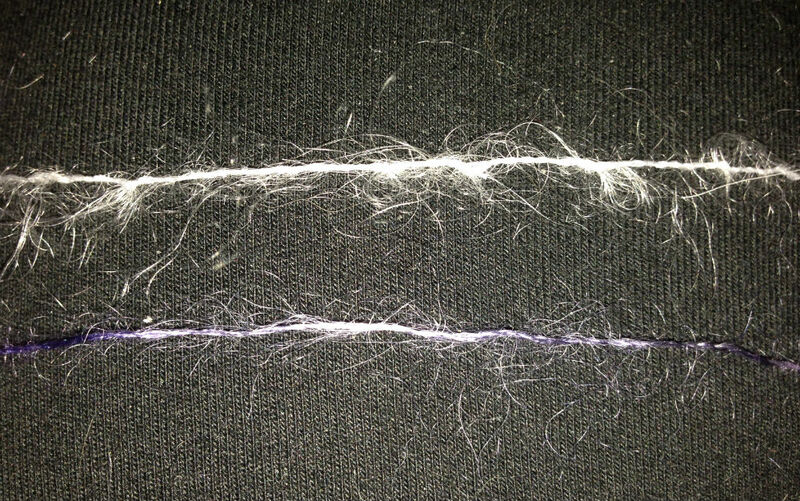 I think the higher silk content makes quite a bit of difference. 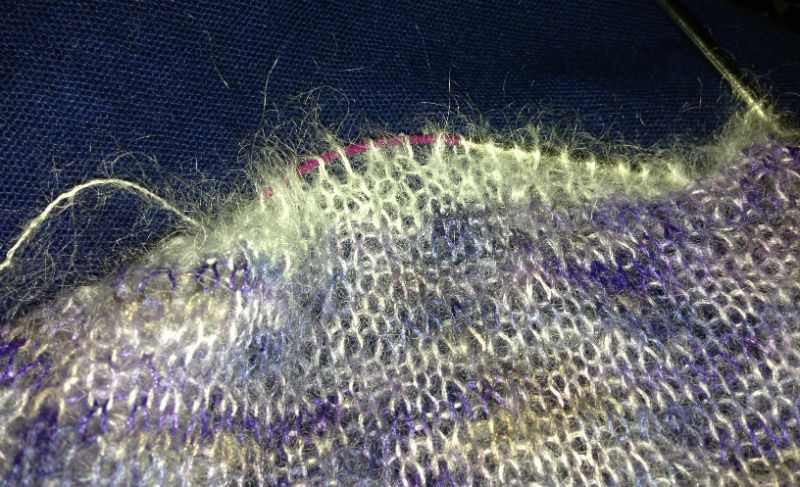 In this case, less (mohair) is more. We’ll see which I prefer once it is finished.